PH Ltd, trading as WPH Marine Construction, has over 40 years’ experience undertaking work within the marine construction industry engaging large and small projects. Our experienced team of engineers & contractors are able to provide a extensive range of marine services. All of our marine craft are registered with the Port of London Authority and we are listed as an approved contractor working on the River Thames. Our main interests are predominately operating on the River Thames and in the South East of England. 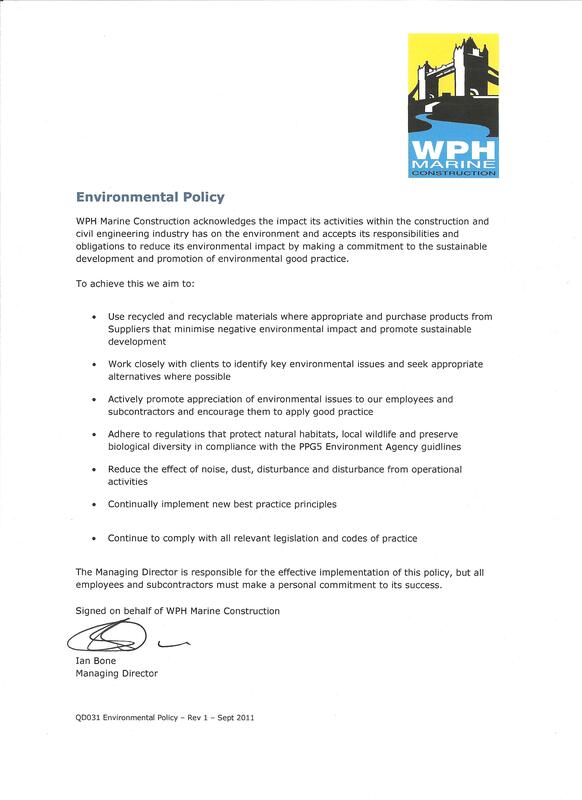 You can read our Environmental Policy here. You can read our Quality Policy here. The WPH Ltd sales and administration office is located in Sittingbourne, Kent and we have safe and secure deep water facilities within the Tilbury Docks, London. We aim to create a sustainable relationship with all of our clients.